1) Marinate sliced pork and minced pork each with little bit of garlic powder, ½ tsp of first draw soy sauce, and ½ tbsp of cornflour. 2) Heat oil and saute sliced shallots over low fire till golden brown and fragrant. 3) Bring a large pot of water to boil (5 big bowls of water), add chicken, minced pork, sliced pork, and shripms into the boiling water and cook for 5 minutes. Then followed by fish cakes and fish balls and let them cook for another 10 minutes. 4) Add a piece of rock sugar into the boiling soup and simmer till it melt and then add mushroom powder to taste. 5) Remove all the cooked ingredients from the soup. 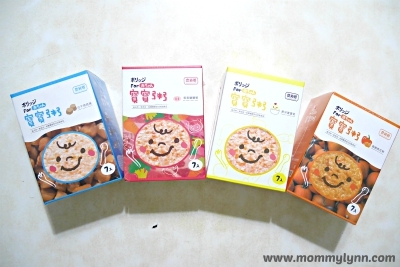 Cut the fish cakes in 2mm slices, shred the chicken and remove shrimps’ shells. 6) Bring water to boil, put the choy sum into a shaker and cook in the boiling water for 2 minutes, remove from the shaker and place aside. 7) Then followed by the koay teow, put into shaker and cook in the boiling water for 40 seconds and remove from the shaker. 8) Place the cooked koay teow according to your preferred portion in a bowl, add ½ tsp of first draw soy sauce (can be omitted for kids under 3yo); garnish with choy sum, fish cakes, fish balls, minced pork, sliced pork, shredded chicken and shrimps. 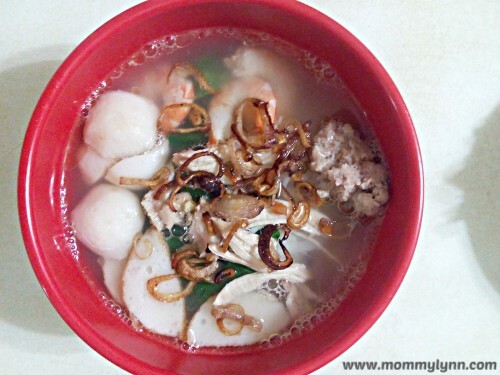 9) Ladle soup over the koay teow and ingredients, sprinkle with fried sliced shallots and dash of pepper then serve. For the cooking preparation, watch the video below.